Summer is here, the Sun is shining and the beautiful and unspoilt Sant’Antioco island﻿ is waiting for you all to enjoy every minute. ﻿Here’s the programme of the summer events organised locally. 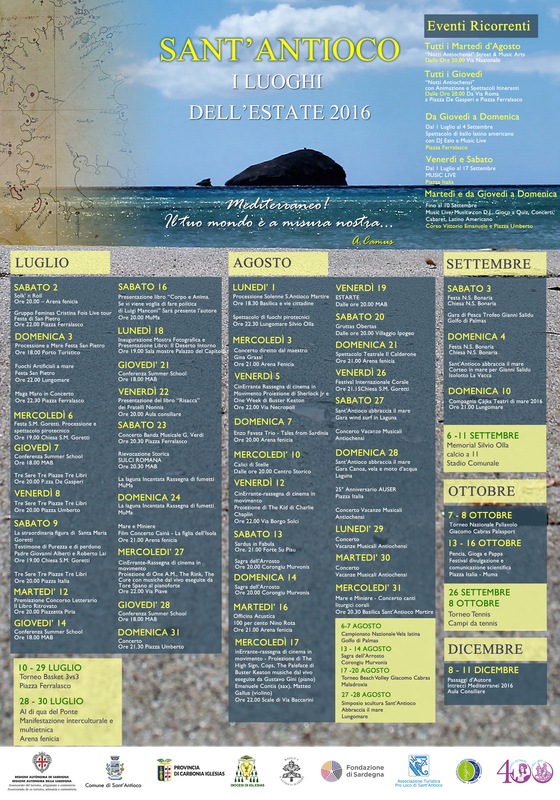 Have a look and enjoy it because…Sant’Antioco is magic! thank you! i’d be honoured to make some invite posts on your blog. what is this about? I simply want to say I am beginner to weblog and absolutely enjoyed your web-site. More than likely I’m likely to bookmark your blog . You absolutely have good posts. With thanks for sharing with us your website page. My partner and I stumbled over here from a different web address and thought I might as well check things out. I like what I see so now i’m following you. Look forward to going over your web page yet again.